A mother and her three little children were rescued safely from an ablaze apartment. All thanks to the brave Des Moines Police officers, Iowa. This incredible moment was caught in camera which showed four police officers heroically catches all three kids who were dropped from a third story window of the burning building by their terrified mother. The senior cops are garnering all praise for their quick thinking and courage after a body camera footage they arrived on the scene was released. The video has since gone viral. It was further reported that the family and the other residents of the building were evacuated from the building unharmed. Lake Michigan Looks Stunning as Frozen Ice Breaks into a Million Pieces! The department said the officers quickly positioned themselves outside the building after emergency services were called in the early morning of March 19. 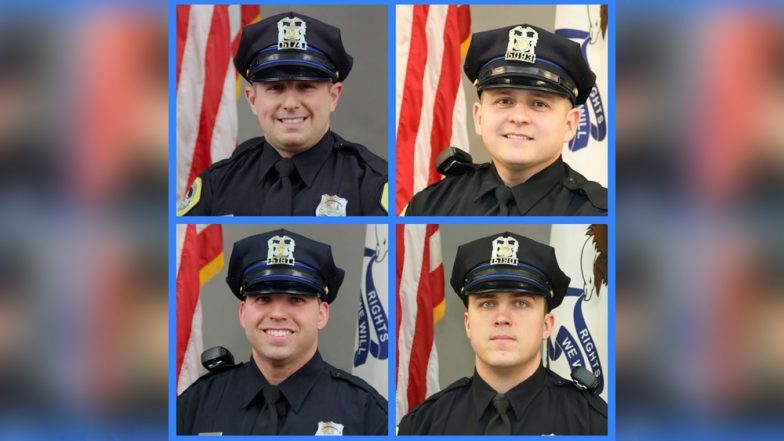 The footage from the scene shows the brave officers, identified as Cole Johnson, Craig Vasquez, Tyler Kelley and Casey Sanders, helping the Des Moines firefighters with a blaze at an apartment block. Officers can be heard assuring the mother to throw the children—all aged three or under one by one to safety. One of the cops can be heard saying, “Ma’am, get all your kids by the window. Send them down, I got them. Drop them.” 45 Rattlesnakes Found Beneath Texas Home! The first child drops into an officer’s arms, can be heard crying but is comforted by the law enforcement official. They continue the rescue calling out, “next one” before all the three children are saved. The cops were further heard comforting the distressed kids while rescue efforts continued to free their mom from the fire. Although the cause of the fire is still unknown, it has been confirmed that all the residents of the building were rescued safely.